Then at checkout, enter the coupon code SFREE. I am currently working on the second book in the Sleeping Judy installment. I am super excited about it! It's the same story, except from Landry's view. 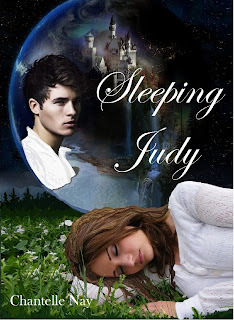 I had a hard time when I was writing Sleeping Judy, not putting Landry's thoughts and feelings into the book. He had a story that was aching to be told, but since Judy saw him as a fictional character from a dream, I couldn't tell his story. Sleeping Judy: The curse is Landry's story in all its glory! Now we can see what drove him, why he acted the way he did, and what he was really thinking through the whole adventure. I think he is so sweet and romantic. I hope to finish it soon and I hope everyone else loves it as much as I do! on Amazon or Barnes and Noble or most other online stores! Get your copy today and don't forget to leave a review! Some people call what I have a disease. Some call it a disorder. Some believe that it was just an unfortunate chance that this happened to me—that there is no one to blame. I know differently. It's all been a lie, all of it, my whole life. On my 16th birthday, the world as I knew it changed. It didn't disappear completely, but it changed into something new and unrecognizable. At first I was afraid—the first time it happened. I was at school, walking out the front doors. Everything around me started to spin and lose shape. I remember seeing the sidewalk coming toward my face in slow motion. I didn't fully comprehend in that moment what was happening to me. I felt the cold rough concrete smack into the side of my head. After that, everything went quiet, then it went dark. I can still remember opening my eyes, what felt like mere seconds later. I was face down, grass and dirt smothering my face. I could hear birds singing and I could feel the sun hot on my neck. I lifted my head up and looked around. Everything seemed more vivid, more alive. I wasn't where I'd been just moments before. What had just happened? Where was I and how did I come to be here? What in the heck was going on? I pushed against the ground, trying to get up out of the dirt, and felt the immediate pain in my joints as I did so. I could tell that the air had been knocked out of me, it was hard to breathe. Maybe I'd broken a rib or something. Obviously I had fallen, just like I remembered doing in those last moments before opening my eyes. The only question now was...from where? "Mallory," my ragged voice forced the name through my lips. Mallory was my closest friend. We'd known each other since we were three, grown up together. She'd been walking beside me when I'd left the school. I swore it had only been a few minutes since I'd heard her tight voice complaining in my ear. She was telling me another story about her math teacher being a troll, and that she was failing her because she was jealous of her beauty. Mallory had always had a high opinion of herself and a low opinion of most everyone else, but I'd grown use to it over the years. No one answered my call. I could see thick trees at the edge of what appeared to be a grassy meadow. It looked dark inside those trees, menacing. "Hello," I called out again, putting as much volume into my voice as I could. I pushed myself up all the way and pulled my legs underneath me until I was kneeling. From this position I could see all around me. I must be in a park or something. There was nothing but grass and trees and blue sky. "Well, I don't think I'm in Chicago anymore," I sighed to myself to break up the quiet of this place. I had lived in Chicago my whole life. I was used to the sprawling city, the heat that rose off the pavement, the smell of exhaust and the grey-blue sky that covered the city like a blanket. There was no noise here. Where was the honking, and the engines and the tires squealing? Where the sound of the bells in the clock tower or the shouting of the taxi drivers? Where was the sound of people—thousands of people moving through the city, going to work, heading to the store, picking up their kids from daycare? I rose to my feet slowly, wrapping an arm tightly around my rib cage when a sharp pain shot through it. I probably needed a doctor, but first I needed to find out where I was. I began to walk slowly toward the tree line, and then paused at the threshold. "Don't be afraid," I told myself. I took three steps forward and I was inside. The shade was cool and moist. A stark contrast to the air outside in the meadow. I took a few more steps followed by several deep breaths. The trees made strange creaking sounds as some invisible wind moved them far up above. The broken shadows created by the leaves up above made it hard to know if I saw movement out of the corner of my eye, or if it was just a figment of my over stressed imagination. A loud quick knocking sound startled me and I spun around quickly. Several unseen birds took flight, disturbing the eerie silence further. I covered my mouth with my free hand, stifling a scream. Something told me that it wasn't a good idea to give away my position when I wasn't yet sure what else might be out there. My breath came out in huffs as I tried to calm myself. "It's just a park," I whispered to myself. "Any minute I'll step out of the trees and find out that I'm in the middle of the city and this has all been some kind of trick." Even as I said it, I knew that it was a lie. I'd been to the city park before, and this was not it. But surely there had to be some kind of civilization around here. I hadn't left the planet. I pushed forward with more speed, more conviction. I needed to get through the trees to see where I was. The sharp crack of a branch behind me made my breath catch. I couldn't turn to see what had made the sound. I began to run, letting the thick branches of brush slap my arms and legs and scratch the exposed skin of my arms. I kept running long after I'd left the sound behind me. When I couldn't run anymore without my heart exploding in my chest I finally fell to the ground behind an old broken stump with moss growing out the top. I peered around it slowly, looking for any sign that I had been pursued. There was nothing, just the songs of the birds, and the rustle of the breeze through the canopy above me. I sat down and pressed my back up against the weathered stump and buried my face in my hands and began to sob. I usually wasn't much of a crier, but nothing about this situation was usual. I was lost and alone and scared. It was getting darker and there were probably wild animals in this thick, relentless forest that would have no aversion to eating me as soon as the first chance presented itself. I tried my best to muffle my little sob fest. I realized once again that it wasn't safe to draw attention to myself. If I was going to remain safe, then I would need to remain hidden which meant that I needed to be silent. I wiped the back of my hand across my tear streaked face. This situation called for strength and confidence. I had little of both, but no one else needed to know that. I looked around the stump once more before rising to my feet again and continuing in the direction I'd been trudging before I'd gotten scared. I tried to remember something useful. I'd been to summer camp almost every summer since I'd turned eight. On the hikes the instructor usually went on and on about how to tell the direction you were going, what to do if you got lost, and how to avoid bears and other dangerous animals. I remember him saying that to find your direction you needed to be able to see the sun. No matter where you were in the world, the sun always rose in the east and set in the west. I looked up toward the sky, hoping to get my bearings. The sun was up, but it filtered unevenly through the thick green up above. I needed to get out of the trees and get to higher ground. I kept moving, faster and faster until I was almost running again. My arms and legs hurt, and the sharp pain was still present in my side. I was hungry and thirsty. The next sound I heard made my dry throat jump with anticipation. It was the unmistakable burbling of water moving in a stream and it was close. I pushed my legs forward in the direction of the heavenly sound. Finally I came to a sharp drop off with the stream just below. It wasn't that high, maybe six feet, so I got down on all four and then lowered myself backwards over the edge until my feet hit the dirt below. I dropped to my knees and began scooping the water with my hands and slurping it greedily out of them. My mind screamed at me about the dangers of drinking water straight out of a stream of an unknown source, but I didn't listen. If I got sick and died, at least I wouldn't be thirsty. The water was good. So cold and clear, better than any of the filtered water from back home. I drank more than I needed because it was so good. When I stopped and leaned back against the dirt wall I had just descended, I heard the water slosh in my stomach. I couldn't complain, it had been so worth it. I stood up, knowing that I needed to keep moving. I was worried about leaving the stream behind me, in case I got thirsty again and I couldn't find it. I decided to follow it. It definitely led somewhere, and since I didn't know where I was going anyway it couldn't hurt to have something to follow. I walked along the edge of the flowing water, skipping over it now and then in spots where it wasn't very wide. It turned and curled as it made its way along. And I found myself enjoying the company of it. I didn't feel so alone now with its constant chatter there to keep me entertained. After the next bend I could see that the trees opened up a bit, as I got closer I could tell that the clearing was not made by nature, but by man. The stumps of trees poked up out of the grass and over to the west there seemed to be a dirt path that led further into the trees. My eyes followed the path backwards, searching for its origin, and that's when I saw the cottage. Like a fairy tale, the small stone structure was nestled in the trees. It had a thatched roof and a stone chimney that poked through it. The windows had no glass, but were covered by cloth which appeared clean and untattered—someone lived here, or at least visited often. Small flowers created a border around the whole thing. I stepped out of the safety of the trees and headed toward the cottage with apprehension. I had no idea whether anyone was home or if they were friendly. I reached the front door which was a heavy wooden hunk of wood that had been intricately carved with swirling designs and the silhouettes of birds. I raised my hand up and noticed that it was shaking. I took a deep breath, closed my eyes and knocked. Stepping back, in case I needed to run, I waited. There was no movement, no answer from the tiny cottage. A little braver this time, I knocked again. It was answered again by silence. "Hello," I called. "Is anyone home?" Nothing still. I stuck my hand out and grasped the latch. I lifted it cautiously. The door opened with a pronounced creak and I stuck my head inside. It was dimly lit, the cloth window coverings preventing the natural daylight from entering. I took one step in and then another. "Hello," I called again. The room was empty. The entire cottage consisted of one large room. There was a fireplace against one wall with a large iron pot hung over it. There was a wash basin and empty water pitcher on a small table on another wall. Near the back corner I could make out a small bed with a patchwork quilt and a fluffy white pillow. Nearest the door was a coat tree, which was empty. A large braided rug covered the center of the floor and a small whitewashed table with two chairs sat in the middle of it. I stared around the room in awe and disbelief. Surely this wasn't real. It was like an antique doll house brought to life. I walked over to the table and couldn't resist running my hand along the back of one of the chairs. It felt real. I headed toward the fireplace and peered inside the large pot. It was empty, but clean, as if it was used often and was a prized possession. Next I went to the washstand and looked into the oval mirror that hung from the wall aabove it. I looked horrible. Dark streaks of dirt smeared my face, apparently left over from my crying jag earlier. I picked up the water pitcher and took it outside to fill it in the stream. If I could clean myself up and rest for a while, I'd have a chance of making some sense of all this. Someone lived in this place, surely they would come back sooner or later and I would be saved. I bent down near the edge of the stream and lowered the pitcher into the current to capture some water. A dark shadow rose up above me and the hairs on the back of my neck stood on end. "What do you think you are doing?" A deep, husky voice demanded. I whipped my head around and was blinded by a bright stream of light coming out of the trees. Before I fainted, I saw the silhouette of a man standing above me. In his hand he held a sword. 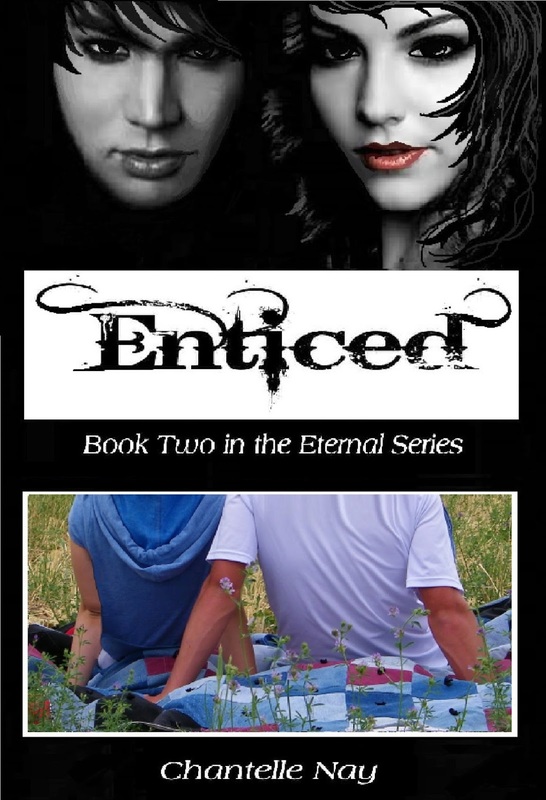 My second book, Enticed is now available as an ebook! You can get it on Amazon at this link : http://www.amazon.com/dp/B00E6K80ZM or on Smashwords which accommodates all other downloads such as nook and sony and pdf at this link:http://www.smashwords.com/books/view/341121 the print book will be available in a week. 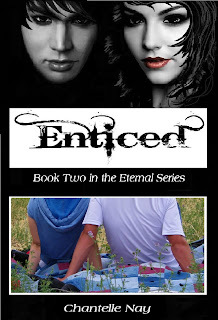 Possible cover ideas for Enticed, coming out this month. Which is your favorite? In celebration of being Author of the Month for the teen romance group at Goodreads, Eternal is available at smashwords and amazon for .99 this entire month!! Happy Reading! 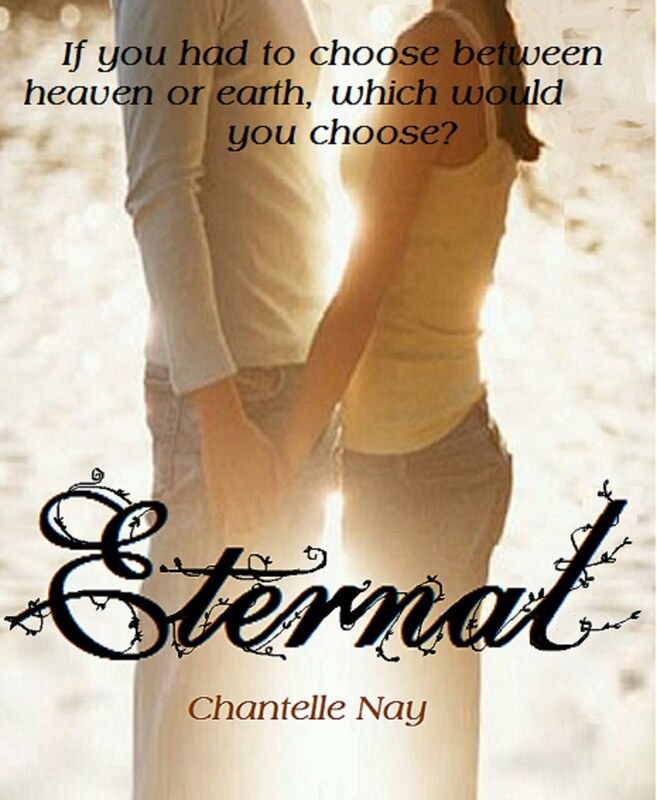 An interview with Chantelle Nay, Author of Eternal, from Goodreads. A lot of the stuff out of the book actually happened to me. (No, I didn't have a romantic relationship with an angel)I grew up in a fairly small town. When we went on dates we went up in the mountains or went fishing or four-wheeler riding. The real idea for the book came from an experience I had as a teenage girl that is actually the opening of chapter one. My parents were going through a divorce and I was having a hard time with it and feeling unwanted and unloved. I went outside in the dark to pray to whoever would listen and I felt the loving arms of an unseen being wrapped around me, letting me know that I was loved and important. 2) Who are your biggest writing inspirations? People might think it's corny, but I love Stephanie Meyer and the Twilight series. I've read the whole series several times through. When the books ended, I was left wondering, what next? I decided to write a story of my own about forbidden love and coming of age. 3) What's your typical writing schedule like? I write whenever I have time. I have six kids and a small farm. There's always plenty to do, but I try to work on whatever I'm writing at the time a little bit everyday. Most of the time I end up writing late at night when my kids are in bed. 4) What do you love the most about writing? It's a personal expression of myself. A lot of me and my personality and thoughts come through in my stories. I love that. It makes me happy to know that there are pieces of me out there in the world and I love to hear back from readers who can relate to the things I write about. I got a message from a reader on the other side of the continent who told me that the things I wrote about kept her up at night thinking, and that she'd never looked at things the way I presented them. That's exciting to me! 5) How do you avoid writers block and what are your absolute favorite methods? If I don't know what to write next, I often go back and read through what I already have until it sparks an idea of what should come next. It's amazing how much a story will write itself if you let it. For example: In Eternal, I had a totally different ending planned and different male character winning the girl in the end. The other male character was only in the story to create suspense, or a love triangle, but he refused to be a background character and actually ended up changing the ending of the book. Sometimes I will have an idea generating session with my husband or my daughter, they are good at helping me come up with stuff I hadn't thought of before. 6) Are you currently working on anything new? How do we keep up on updates? Judy is just your average teenage girl with average problems, until she receives a mysterious gift on her sixteenth birthday. One prick of her finger, one drop of blood, and the adventure begins. The doctors tell her it's a rare sleeping disorder, but while she's asleep she exists in a different world. Should she try to cure the disorder that will take her away from her fantasy world and the handsome boy who lives there? Falling asleep has never been so romantic. Share her journey as she discovers who she truly is and where she belongs. What if you had to choose between Heaven and Earth, which would you choose? 17 year old Emma is ready to graduate from High School and leave the small town of Eden behind her. But when she's saved from a brush with death by a mysterious voice, her focus quickly turns to contacting this guardian angel that she knows is out there. Falling in love with an angel is not what she had planned for her life, but Micah quickly becomes the center of her universe...that is until a new boy moves to town. Destry McQuade is gorgeous, but strange. He watches Emma from the shadows. When they finally get together there is an undeniable connection and an electrical current that flows through them whenever they touch. Now Emma learns that Micah has been keeping something from her all along. Will the truth destroy everything that she believes or will it set her free? Either way she'll learn that true love does exist, and it really is Eternal. In this second book from the Eternal series Destry and Emma are destined souls, meant to be together. But the Dark Ones are determined to tear them apart. Something evil is lurking in the shadows, and Emma must find a way to defeat the demons who threaten to take away the boy she loves or lose him forever. But she can't do it alone. The powers of Heaven take on the angels of Hell in this last chapter of the Eternal series, and there can only be one winner.